Coauthored by three physicians and a dietitian, this quick-reference manual providespractical, state-of-the-art, evidence-based nutrition recommendations for healthy adults, hospitalized patients, and people with a full range of health conditions. It’s an ideal source to help youmeet the nutrition needs of every patient. Effectively counsel healthy patients with nutrition recommendations for bothyoung and older adults, and provide specific guidance for patients who arepregnant or lactating. Find information on individual nutrients (e.g. vitamin D, iron), contained in a dedicated section covering nutrient components. 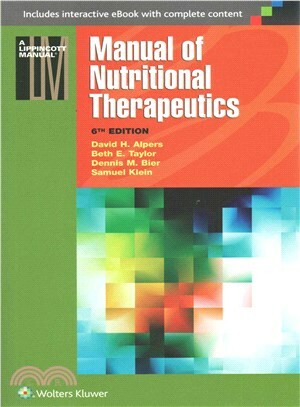 Get detailed guidance with separate chapters on Protein and Calories, Vitamins, Minerals, andDietary Supplements. Access advice specific for metabolic disorders (diabetes, dyslipidemia, and renal disease), for obesity, and for chronic wasting diseases (cancer, AIDS). Make informed decisions on enteral and parenteral nutritional therapy.